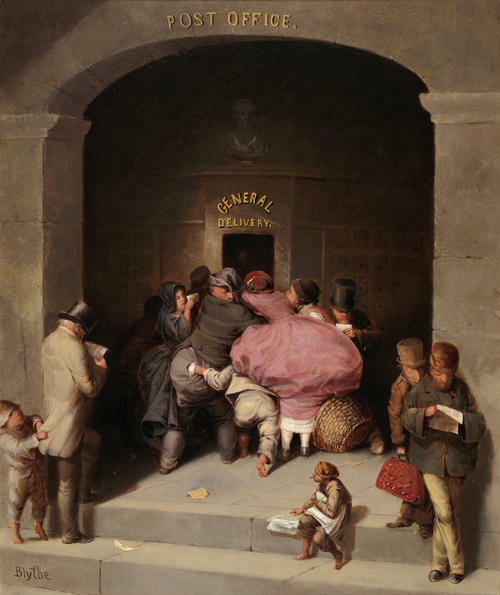 Set in Pittsburgh, the painting satirically depicts urban ills, as described on its CMOA page: "The Neoclassical bust over the delivery window alludes to the idealism and dignity of the American past, while the indifferent newsboy on the steps symbolizes the squalor of contemporary urban life. In pairing these figures, Blythe contrasts the noble ideals of the nation's founding fathers with the greed, self-interest, and venality he sensed in his own times." From William T. Clark diary: "We leave Pittsburgh Pa. at 5:45 p.m....We gladly leave this black greasy, smoky city." From an April 5, 1868, Columbia Spy account entitled, "A Western Editor's Description of Pittsburgh": "It is now seventy-two years since Pittsburgh has been warmed or reached by the sun's rays...The ladies use smoke and coal dust to protect their complexion...Men kiss each others' wives in Pittsburgh, unable to tell which is their own only by the taste. Women send children on errands, first writing on their faces with a thumb nail or wet stick."